The other evening whilst I was sitting quietly in a circle with friends (see entry for 19th September), into my head popped the image of a labyrinth. The strange thing is, it was imprinted onto the right side of my forehead and this seemed to be important for some reason. With it came a long line of black chevrons closely spaced together. The chevrons were the ones you get on the road to indicate a bend ahead and point in the direction you need to go, although these ones were not pointing in any particular direction. It seemed perfectly logical to marry the chevrons with the image of a labyrinth which after all, is all to do with going round in circles. 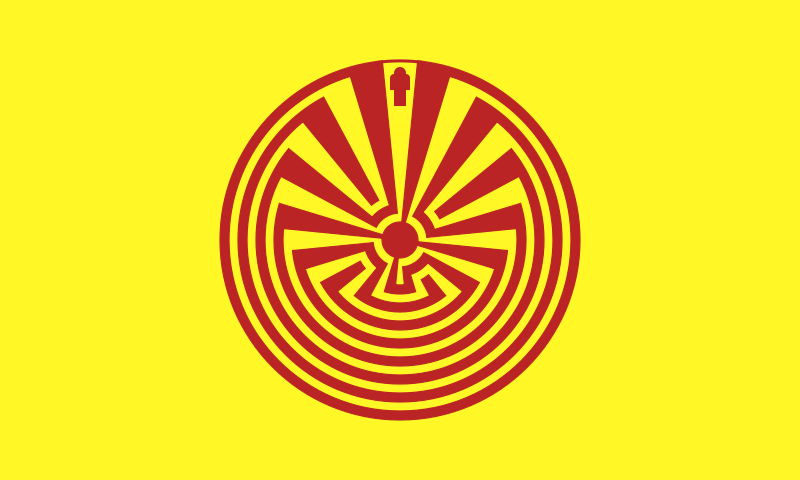 The I’itol symbol: The Man in the Maze, comes from the tradition of the O’odham people who reside in the Tohono O’odham (Native American) Nation of Southern Arizona. This symbol (actually a unicursal figure) is said to represent a person’s journey through life with its many twists and turns that represent the many choices we face along the way. The journey is one from darkness towards enlightenment and the man at the top depicts your guide who is with you on your journey from your birth until you reach your death at the centre from where you will be transported to the afterlife. I wonder where I am / you are on that journey? And the more I think about it the more I realise that getting lost is in fact getting found! It is only in that solitude that I am able to find my true voice. Far from being fearful of finding my way back to the path, I am beginning, more and more to relish the peace that being alone brings: a space in which I can commune with my creative urges. Perhaps we should learn to cherish those moments of getting lost more: how else might we stumble upon the unexpected, discover new directions or see a familiar thing from a different angle? Often, getting lost, forces us to ask for help, something a lot of us are not very good at doing. Although this post doesn’t strictly speaking, fit into a conventional ‘photo challenge’ I felt it was appropriate. For other ideas on this weeks Photo Challenge: From Lines to Patterns, see here. P.S. 23rd September. Walking the dogs today I notice that someone has been out flaying the edges of the paths (as they are wont to do). In the debris lying on the ground, I rescued a few sprigs of purple heather (Cornish Heath) which I decided to take home and put in a little pot vase. Being mildly aware that ‘someone’ has prompted me to do this (I often get this feeling), when I got home I went on-line to find out what the flower meaning for heather is, only to discover that it is ‘Solitude’. What a lovely poetic endorsement. Thank you! Synchronicitously, driving back from Bath this weekend, I was listening to some ‘Talking Walking’ podcasts and came across this interview with a ‘labyrinth facilitator’ http://www.talkingwalking.net/danielle-wilson-talking-walking/ Initially, I was a bit sceptical that such a thing was necessary (it all sounded a bit sort of interventionist, or worse, corporate management speak!) 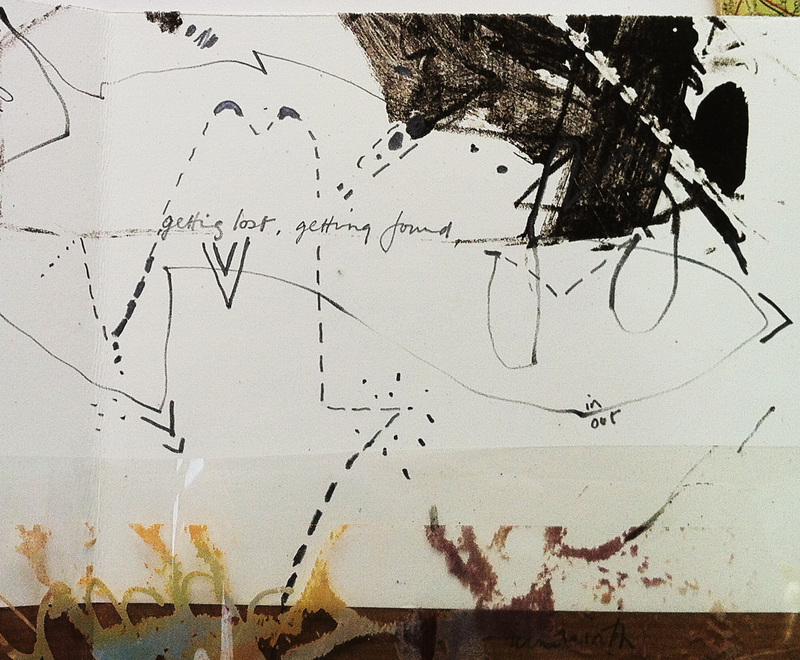 but as I listened, I realised the importance of this kind of working in transforming what is ultimately a pictorial/geometric ‘shape on the ground’ into the place of spiritual practice, pilgrimage or exploration that it becomes, and ‘holding’ that space. Dear Jess….what a wonderful, timely set of ideas! Bram’s weekend still lives with me and seems to be re-kindling many half-abandoned ideas back into life. Rebecca Solnit’s ‘Field Guide to Getting Lost’ is already top of my Christmas list, and many thanks for the talking-walking link. 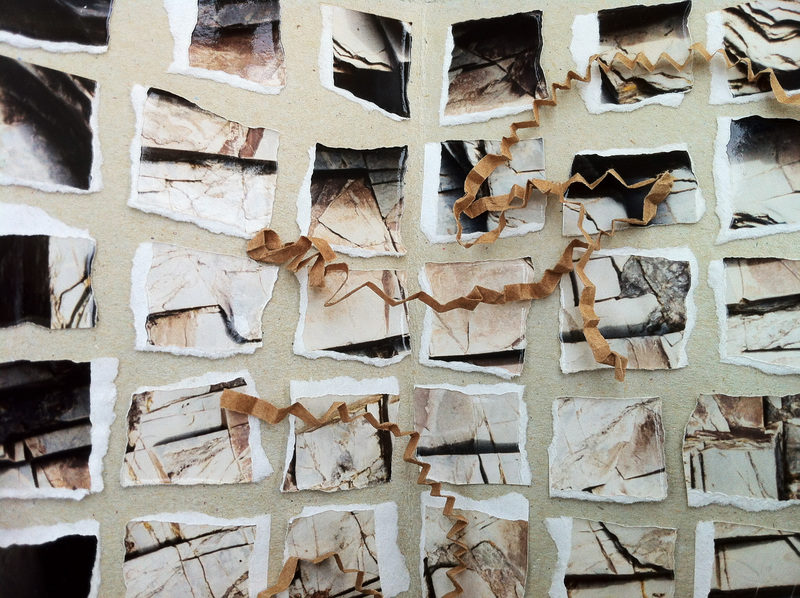 Daniella Wilson’s website about community labyrinths labyrinths was a lovely find. Thank you. And I loved your description of how your ‘drop in the ocean’ project came about. dropintheocean with many beautiful images (not to mention the ideas and images in the ‘all in a days walk’ also, with a glimpse of Merlin’s mane). Listening to Daniella’s podcast about her ‘labyrinth’ work and looking at your performance at All Saints Church has made me revisit the draft of a blog post I began a couple of weeks ago which I titled ‘A coiled Spring’ and which now needs to be ‘put out there’! So thank you for that. Synchronicity indeed. As this line of enquiry gains momentum I believe it has more significance for me than I had first supposed and has strong connections with my interest in Mandalas. (I have spoken briefly to Mas about this before and his ideas about ‘coming home’). Coming full circle, perhaps?